I’m just now starting to read my new book, “Fur Kids: A Life with Dogs” and am thoroughly enjoying it. I didn’t realized when I opened the package that you had written a note to me and signed my copy. My wife saw that first thing when she browsed through it and had to bring it to my attention. Thank you so very much. I wanted to ask if you could sign my book so that it will go along with your first one that you signed at the American Brittany Rescue picnic, but there wasn’t any place on the order form for comments. Thanks again for signing my book. Mr. Buchanan made me laugh uncontrollably and cry as deeply. I read this book in one sitting and was so moved I proceeded to purchase several copies for friends. Anyone who has ever loved a pet of any kind will never forget this book. The author writes with acute sensitivity and extraordinary humor. One will never look at tomato juice in the same way after “Living with Brittanys.” Bravo…and 20 stars!!! This book confirmed what I remember about Brittanys from childhood; they are mischievous, physically challenging, and personable. I especially enjoyed reading about the effect that the distinct personalities of three Brittanys had on the owners. The special attention that these two people gave to their dogs and the pain that they experienced when the first two died is particularly poignant. Humorous and in some case hilarious incidents punctuate this fine memoir. I also found the description of beautiful wilderness areas compelling. This is an uplifting and inspirational book for troubled times. This book was entertaining. If you love Brittanys, you will find this book to be a fun read. It was real life with Brittanys. It gave me a new appreciation and understanding for the Brittany I have lived with for the past year. Since I had the honor of meeting these dogs, the descriptions of their lives with the two owners meant more to me than the average person; however, I will attempt to be unbiased. This account will certainly give one the ideas of what different personalities dogs have within the breed which can affect your choice of a dog that must suit your lifestyle and surrounding. Through semantic skill and vivid descriptions of the terrain, the reader will sense Bill’s affection for the environment, the need to respect it, and our responsibility to take care of it. Most importantly, the reader will learn the pitfalls, the pleasures, and the humor of owning a Brittany. If you’ve been in search of touching dog stories, and want to experience a delightful memoir of what its like to share your heart and home with dogs; If you’re hearing the calling to find your own fur kids, and researching the characteristics’ and qualities of Brittanys, or have owned Brittanys in the past, then this book is for you. 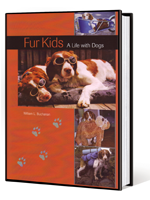 Fur Kids will provide fresh insights into the breed’s characteristics and qualities, while whisking you along a man and woman’s travel adventures, as they share their sometimes humorous journey of joys, challenges, and sorrow of living with five furry souls. Even if you’ve never owned a dog, or have lived and worked with Brittanys for years, you’ll find an excellently written story, with an uncommon freshness, that draws you into the experience of sharing adventures with dogs. Fur Kids isn’t your typical memoir; It’s a journey into the heart, mind, and experience of sharing nature and life’s adventures with the animals we love; its descriptive accounts of nature and being in the wilds are sure to touch anyone who loves the outdoors, especially those who have given their hearts to sharing their lives with dogs. Follow columnist William Buchanan as he recounts his life’s emotional journey of sharing experiences, and adventures with his wife and their five uniquely different fur kids.